If it's December, it must be time to trot out another Dante-themed Blawg Review! 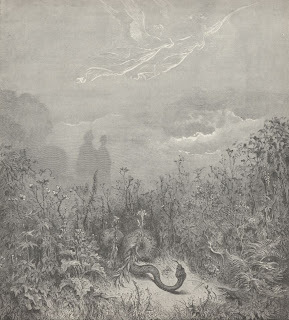 Following the Inferno-themed Blawg Review #35 and the Purgatorio-themed Blawg Review #86, The Divine Comedy's third cantica, Paradiso, provides the theme for Blawg Review #137, to which I welcome you. In one part more and in another less. That after it the memory cannot go. Him for whom Grace the experience reserves. After a fashion, this is our challenge as legal bloggers -- to make an often-arcane world of issues and arguments more understandable to one another and to a broader audience. Just as Dante's particular experiences enabled him to comprehend the generally-incomprehensible, many legal bloggers have specialized knowledge which enables them to go beyond mere reportage and to provide meaningful analysis of important legal issues. That makes the universe resemble God. Whereto is made the law already mentioned. From some high mount descending to the lowland. As if on earth the living fire were quiet." Thereat she heavenward turned again her face. Bang! Zoom! If Ralph had ever followed through on his repeated threats, Alice Kramden might have found herself in the sphere of the moon, amongst those who took sacred vows but failed, or were unable, to keep them. While promising to pay a debt is not exactly a sacred vow, for some whose vows were discharged by bankruptcy courts that discharge is proving not to be the end of the line with some debt holders who refuse to accept their losses. Fred Tung of the Conglomerate blog writes that "[h]ounding debtors for repayment post-discharge, an age-old strategy, is clearly illegal. Another device some creditors appear to be using is the failure to report to credit bureaus when debt has been discharged. Eventually, the debtor may need to clean up her erroneous credit report to, say, qualify for a mortgage. If the creditor and credit bureau are not responsive--a relatively common problem, according to some bankruptcy judges--the debtor may have no choice but to pay off the discharged debt." Credit reporting also concerned the writers at the RiskProf blog this week: "One of the major criticisms of credit scoring is the alleged link between a person's race and poor credit score. On the surface the credit score does not know a person's race as it is just based on a set of behavioral indicators (do you pay your bills on time and things like that) which depending on whom you believe might suggest credit scores are a proxy for membership in racial and ethnic groups." The blog concludes that to apply a civil rights-style disparate impact test to behavior-based insurance would be a slippery slope; they write that the "insurance market provides incentives to high risk people to modify their behavior. If people have poor credit scores their cost of risk is higher. Won't this knowledge lead people to make better decisions about their financial health leading to a lower cost of risk in the future?" In the sphere of the Moon, Dante and Beatrice encounter Piccarda Donati, sister of Forese Donati (who was last seen by Dante working out a few of his personal issues in Purgatory), cousin of Dante's wife, and distant relative of Frosted Donati, for whom Homer Simpson was condemned to Hell in Treehouse of Horror IV. 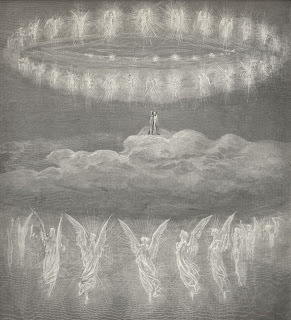 Piccarda explains for Dante a key aspect of existence in the Heavenly spheres -- while there is a structure to it, and even a hierarchy in that some spheres are "higher" than others, everyone is right where they should be and all experience the same communion with God; in other words, despite their differing vantage points, no one soul has a better picture of God than any other soul. To engage in a bit (or perhaps more than a bit) of editorializing, I think that there's a lesson there for those of us in the blawgosphere. In our collective search for legal truths, we may have different perspectives on various issues depending on our positions in academia or in practice, on the political left or the political right, or as seasoned bloggers or relative newbies. Despite our differing insights and experiences, each of us views the same facts. Finding truths in those facts may be beyond any one blogger's capacity; together we will discover many things, not in spite of our differences but because of them. The sphere of Mercury is final home to the souls of those who did good, but for the sake of fame. For the legal blogs named by the American Bar Association's ABA Journal magazine as the best around in the inaugural Blawg 100 list, fame is more the byproduct of the good they've produced than its motivator. The Anonymous Editor of Blawg Review takes justifiable pride in Blawg Review's inclusion in the Blawg 100 and notes that there's a commonality amongst many listmembers -- they're Blawg Review hosts, or soon will be: "Generally speaking... we're in very good company! Some 26 of the ABA Journal Blawg 100 have already hosted their own Blawg Review, and several more of them are scheduled to host upcoming issues." Kevin O'Keefe of Real Lawyers Have Blogs was not so keen on this "vanity contest": "Maybe it's lawyers' low self esteem that requires their egos to be stroked by being on someone's list of the 100 best this or that. Maybe lawyers are so bored that they love gimmicks. Maybe it's websites and organizations that are so starved for attention or relevance that they need to have contests to get their beauty pageant contestants to tell others of the website. I don't know." O'Keefe wondered, "Why not have a contest as to which blogging lawyer looks best in a swim suit?" Well, as anyone who's seen me in a Speedo will certainly attest, there's just no contest there so let's try to keep things realistic, shall we? Anne Reed of the Deliberations blog (a very-worthy entry on the Blawg 100 list) acknowledges O'Keefe's criticism but suggests that, whatever the effort's weaknesses, some good will come of it: "It's self-serving to say it, but I do think I differ with him here. It's true that there are wonderful blogs that won't show up on any national 'best' list, but at least in my own case, any map I could get was very helpful when I was first learning the territory. You find blogs you trust when they're cited in other blogs you trust, and you have to start somewhere. I've gotten a startling number of visitors today from the ABA Journal site, and I hope some of those visitors come to rely on other blogs they learn about here." David Giacalone of the f/k/a blog was somewhat dubious about the value of the ABA's list. He questions the magazine's motives: "[The magazine] probably created its Blawg 100 list mostly to do what every publicly-issued, bottomline-oriented publication wants to do: get attention for itself and more readers (and, thus, eventually be able to charge more for online and in-print advertising)...." Doing good for the sake of one's own fame? Sphere of Mercury for you, ABA Journalers! In the sphere of Venus reside those souls who did good for the sake of love. Large law firms aren't known for showing much love to their associates, but there are perhaps a few who'd like that to change. Deven Desai of the Concurring Opinions blog highlighted the efforts of several firms whose "happiness committees" seek to bolster flagging associate morale with sweet treats and concierge services; David Lat of the Above the Law blog has photographic evidence of an in-house nail salon at one Big Law firm. Desai suggests that "the firms that offer training and a real shot at having a life might keep talent longer. Less pay might even be possible if a firm really cared about giving an associate a life. With the focus on profits per partner and other useless AmLaw criteria that concern will likely be given lip-service only." Arnie Herz of the Legal Sanity blog also wondered about the capacity of those happiness committees' candied apples and other perks to salve the wounds caused by overwork and underappreciation: "All these offerings can reduce stress and overwhelm to some degree. But, I wonder if they make any real difference in firms where associates work long, grueling hours for abrasive partners who give them little to no acknowledgment or constructive feedback." Peter Lattman of the WSJ.com Law Blog suggests that temporary placement firms like Axiom Legal might have the inside track -- if not the partner track -- for many attorneys, offering "choice of clients, a 40-hour week and ample vacation time", but he cautions that some attorneys have experienced "temping hell". Said one such attorney, "I would not wish temping on even the most odious of attorneys I know." As readers of The Mac Lawyer blog well know, Ben Stevens loves his Macs. Born of that love was a personal quest to find a way to make use of the proprietary .ptx file format promoted by RealLegal for deposition transcripts. It's safe to say that you probably will not make it to the sphere of Venus if you have too much personal experience with moral turpitude; notwithstanding, his love of well-crafted contracts makes Ken Adams of the AdamsDrafting blog hope that there are at least a few of you out there in his audience. Adams is having trouble completing a post about the use of "moral turpitude" language in employment contract drafting and has found a very Web 2.0 solution -- he'll let his audience write it for him: "Be as straight-faced or offbeat as the urge takes you. Feel free to remain anonymous for purposes of your comment, but do give readers some idea of the capacity in which you’ve encountered the phrase." The Sun is home to the souls of the wise, including King Solomon, whose wisdom has had a strong influence on the thinking of many in the legal profession. It might take the wisdom of Solomon to make sense of a claim recently filed by 80s one-hit-wonders "The Romantics" against Activision, makers of the "Guitar Hero" video game franchise. Seth Freilich of the QuizLaw blog writes: "Now Activision did what it’s supposed to, and got permission to include a cover. But The Romantics are suing the game company anyway because — get this — they say the included cover version is too good. So good that it sounds too much like the original and thereby infringes the group’s publicity rights. Ah, the lengths that a one hit wonder will go to to milk all that it possibly can out of said one hit." Mike Masnick of the Techdirt blog thinks that "[a]s ridiculous as this sounds, the band may actually have some (equally ridiculous) precedents to back it up. Other musicians have sued when properly licensed covers were used in commercials, claiming that even though the songs used were covers, they sounded too similar and people might assume that the musician endorsed the product in the commercials. In this case, though, there really isn't any question of endorsement -- and, honestly, the Romantics should probably be thrilled that anyone still pays any attention to the band at all...."
Many cultures ascribe great wisdom to their elder members. I was told to respect my elders on many occasions (always by someone older than myself, strangely enough); respect is fine, but how should we protect our elders in the workplace? Perhaps in a different way, suggests John Phillips of The Word on Employment Law, who writes, "The Age Discrimination in Employment Act is flawed.... I’m all for laws that protect people who need to be protected, but laws need to be based on reality. And the reality is that, sooner or later, age will make it difficult, if not impossible, for most people to perform their jobs." I take Sen. Clinton's declaration of support for the Second Amendment--the next question, of course, is what precisely she "believes" the Second Amendment means in 2007--is the best evidence possible for the new-found respect it gathers, at least rhetorically, across the political spectrum. I wonder if her comment alludes to the fact that the DC gun ban that will be assessed by the Supreme Court is not directed at keeping "guns out of the hands of criminals" except inasmuch as a prohibition of private possession of handguns would, by definition, serve that purpose in addition to keeping guns out of the hands of law-abiding people as well. Although in establishing the sphere of Mars as home to fighters Dante was referring primarily to fighters for Christianity and its ancestor faith, Judaism, a modern example of a pugnacious religion is the Church of Scientology. Frank Pasquale at the Madisonian.net blog notes that the Church of Scientology has sought to protect its scriptures as trade secrets; Pasquale suggests that instead of looking to those Scientology documents, "[p]erhaps one could 'reverse engineer' the trade secrets at issue by watching how the elect behave." William of Orange and Renouard are heroes who appear together in other French epic poems. After William discovered Renouard, a Muslim of gigantic stature who worked in the royal kitchen (he had been sold into slavery), to be his brother-in-law, the two men joined forces and fought on behalf of the Franks. William and Renouard (following his conversion to Christianity) spent the final years of their lives together in a monastery. We can trust that in the original Italian, that sounds less like an elevator pitch for a new sitcom. "So get this: there's this Christian monarch and his long-lost brother-in-law, a Muslim of gigantic stature, and they fight for the Franks and then end up together in a monastery. Hilarity ensues! It's like The Odd Couple meets Little Mosque on the Prairie meets Kung Fu! I see that 'I'm a Mac' guy as the gigantic Muslim." 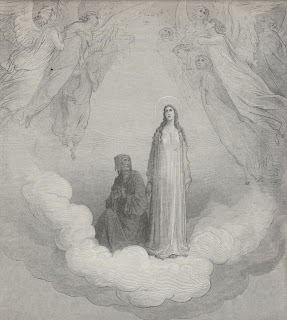 In 1919 Professor Miguel Asín Palacios, a Spanish scholar and a Catholic priest, published La Escatología musulmana en la Divina Comedia ("Islamic Eschatology and the Divine Comedy"), an account of parallels between Islamic works and the Divine Comedy. 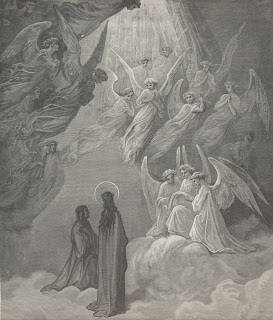 Asín Palacios argued that Dante derived many features of and episodes about the hereafter directly or indirectly from various versions of Islamic works: the Hadith and the Kitab al Miraj (translated into Latin in 1264 or shortly before as Liber Scale Machometi, "The Book of Muhammad's Ladder") concerning Muhammad's ascension to Heaven, and the spiritual writings of Ibn Arabi. The work of Professor Asín Palacios was criticized by many groups, including nationalist Italians, the Roman Catholic clergy and other European Christians. He responded by enumerating the possible sources from which Dante could have obtained the salient features of Islamic eschatology. More recently, scholar Giorgio Battistoni has brought to light the role that commissioned Jewish translators working in European circles during the 12th century played in making Arabic texts available to Christendom. 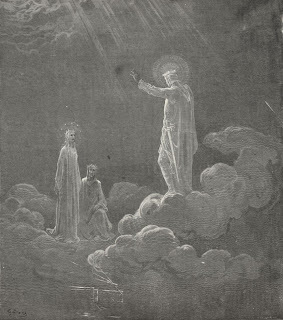 Battistoni believes this to be a clear route by which the possible sources of influence may have reached Dante. Shortly before her death the Italian philologist Maria Corti pointed out that, during his stay at the court of Alfonso X, Dante's mentor Brunetto Latini met Bonaventura da Siena, a Tuscan who had translated the Liber scalae from Arabic into Latin. According to Corti, It appears likely that Brunetto played a crucial role in providing Dante with Arab sources. 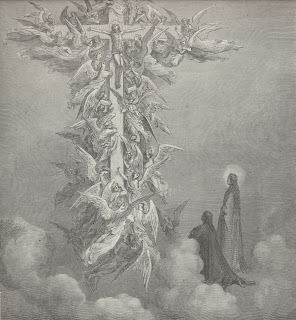 Regardless the nature or provenance of Islamic influences upon Dante, the increasing interaction between the Muslim and Christian worlds in his day has an obvious parallel in ours. As such, it's a pleasure to welcome to the blawgosphere a new blog concerning Shari'a (Islamic law) in today's world -- Islamic Law in Our Times, written by Haider Ala Hamoudi of the University of Pittsburgh School of Law. The sphere of Jupiter is the abode of those who served justice. It can be hard to serve justice, though, when those around you are intent on being uncooperative. Roy Ginsburg of the Quirky Questions blog advises that when faced with a "tension between the competing interests of employers to provide a safe, violence-free work environment, and employees’ legitimate privacy interests... the interests of the employer predominate." When employees won't cooperate with your workplace harassment investigation, he writes, "you could impose any discipline you deem appropriate, including discharge." If you're a discharged employee, you might tend to wonder whether that arbitration clause you agreed to when you started will work in your favor. According to Eugene Lee of the California Labor and Employment Law Blog, there's no need to wonder anymore -- arbitration clauses are bad for employees. The researchers found that when both monkeys in the pair received cucumber slices, there was no problem. But when one of them received a grape while the other received a cucumber slice, the latter monkey let her displeasure be known. She would either drop or throw the cucumber slice on the ground or simply refuse to accept it and turn away. Further, the researchers found that the Capuchin monkeys were concerned only with fairness to themselves, and not to others: While humans regard fairness as equal treatment of themselves and others, the Capuchin monkeys only care about number one." The few [imprisoned attorneys] who have been released tell chilling accounts of the mental and physical torture to which lawyers are subjected. Their only 'crime' being that they stood up for the rule of law and democracy in Pakistan. What of the fate of the hundreds of lawyers and civil rights activists still languishing in dungeons around the country? Their fight is our fight! When they raise their heads to face the brutality of the police they sacrifice themselves for every Pakistani, and for the rights and liberties of all citizens of this country. As the abode of the souls of monks, the sphere of Saturn is a place for contemplation. Contemplating things this week and concluding "Whoddathunk it?" is Diane Marie Amann of the IntLawGrrls blog. Amann noted the odd turn of historical and political events which has transformed a thousand square kilometers of land on the Korean peninsula from the no-man's land of the demilitarized zone between North and South Korea into a de facto wildlife refuge: "After fifty-four years free from man’s intervention, the DMZ has become a sanctuary for dozens of species, including tigers and leopards, in danger of disappearing elsewhere." David Bernstein of The Volokh Conspiracy suggests that perhaps the Florida Supreme Court should spend a little more time contemplating their recent decision to "welcome junk science": "In short, the Florida Supreme Court essentially held that any qualified medical expert (with qualifications always defined loosely) can testify to almost any causation theory, without any real judicial scrutiny. Florida law, then, has regressed to the pre-Daubert let-it-all-in stage, at least with regard to medical causation testimony." Bernstein's co-conspirator, Ilya Somin recently found himself back in Israel and, seeing how efficiently the Israeli airport security officials operated, he wondered whether our own Transportation Security Administration is another group which could spend a little time contemplating their preferred approach. Somin noted that the Israelis don't bother examining travelers' shoes but do spend some considerable effort in profiling those who pass through their transport systems: "What can we learn from the Israeli approach? Obviously, the TSA should be compelled to forego its idiotic shoe procedures. Whether we can adap[t] the profiling aspect of the Israeli system is much harder to say. Israel has the advantage of having only one major airport. Requiring such individualized screening at the hundreds of major airports in the US would be much more expensive and might significantly slow down air traffic. Moreover, some of the questions the Israeli security people ask would be illegal or politically unfeasible in the US." Brett Trout of the Blawg-IT blog is contemplating what might have been in the minds of the inventors (or buyers) of the products described in several ridiculous patents. Of a "sphincter training device" he writes, "While I am not sure if my sphincter possesses the capacity to learn any tricks, I am fairly confident I have no desire to find out." The souls of the blessed dwell in the sphere of the fixed stars. If the idea of "fixed stars" seems a bit odd, it should be noted that Dante and many of his contemporaries were great believers in astrology, seeing the constellations as evidence of God's power. When Brian Leiter recently attempted to determine which legal academics' work had been most-blessed by their colleagues' legal citations, his own efforts drew some sharp criticism. Mary Dudziak of the Legal History Blog wrote that in Leiter's rankings "[t]he impact of interdisciplinary scholars, in particular, will be under-counted. For serious interdisciplinary scholars, especially J.D./Ph.D.s, the true measure of scholarly success is to be seen as leading figure both within the legal academy and within the Ph.D. field.... The limitations of this sort of study are not ameliorated by separating out a field like legal history. Using the Westlaw database will undercount those scholars who have a stronger impact across scholarly journals (beyond those in the legal database), and who do more publishing in books and peer reviewed history articles." Gordon Smith of the Conglomerate blog didn't dispute Dudziak's criticisms; instead, he wanted her to run with them -- "if you want to measure interdisciplinary impact, create your own rankings!" Brian Tamanaha of the Balkinization blog shared some of Dudziak's concerns and suggests that "the problem has to do with the bizarre citation practices that have developed in U.S. law reviews. Law reviews typically require that almost every assertion be backed up by a reference; articles often have in excess of 400 footnotes, nearly one for every sentence.... As a result, law professors are required to produce reams of citations, even for commonplace assertions, a task they sometimes push off on research assistants. Over time, stock or standard citations develop, which are cited again and again." Jack Chin of the Concurring Opinions blog took Leiter's numbers at face value and further sliced-and-diced them by school affiliation. Stephen Bainbridge of the Law and Business blog was excited to make the list ahead of his fiftieth birthday: "In Brian Leiter’s latest rankings of the most cited law faculty in Business Law, I ranked 14th. I’m also the only professor in the top 20 under the age of 50, which strikes me as significant given Leiter’s comment that 'the lists are dominated by faculty in their 50s and 60s.'" 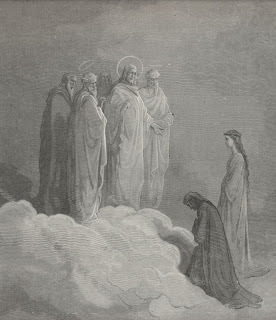 While in the sphere of the fixed stars, Dante is tested several times -- by Saint Peter on faith, by Saint James on hope, and by Saint John the Evangelist on love. Also subjected to testing on numerous topics, but by less saintly examiners, were recent bar applicants in New York. Eric Turkewitz of the New York Personal Injury Law Blog, considering the fact that the New York State Board of Bar Examiners admitted losing the answers submitted by numerous examinees who used laptops, wondered how they managed to grade the exam. He noted that the Board claims it took "educated guesses on the missing results" but further noted that "over the holiday weekend, [an] anonymous comment appeared on my site, claiming that credit was given for an essay with no answer, and the same credit was given for an essay with a great answer. And there was no indication that this person was told his/her essays were part of the missing ones...."
The Primum Mobile -- Latin for "first-moved" -- is the abode of the angels. Well, one angel at least -- my fellow Blawg Review Sherpa, Diane Levin, who suggested more than a dozen worthy posts for this edition of Blawg Review. The Old Testament emphatically supported the death penalty, and certainly Jesus declared he did not come to destroy the law but to fulfill it. At the same time, New Testament teaching replaced the morality of "an eye for an eye" with "turning the other cheek." Certainly Christ intervened to stop the stoning of an adulteress, but without knowing more, can we universalize from that one example? On the cross Jesus forgave the thief next to him, but despite his divine powers over death, still allowed him to perish. Trying to divulge Jesus' position on capital punishment from these philosophical hints is like guessing the number of angels dancing on the head of a pin. 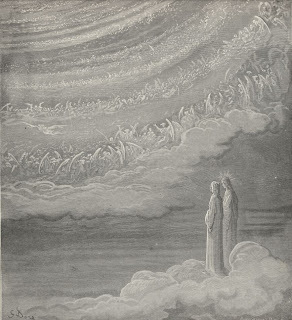 Beyond the Primum Mobile is the Empyrean, where Dante encounters God Himself. 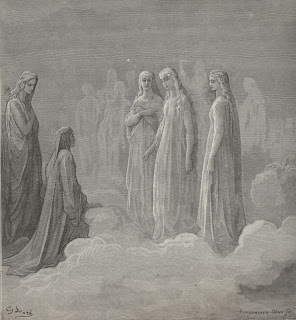 In his travels through Inferno, Purgatorio, and Paradiso, Dante has gained a greater understanding of the nature of God, yet He remains mysterious to the poet. This seems an appropriate moment for me to offer my thanks to the ever-mysterious Anonymous Editor for this opportunity to host Blawg Review for a third time. Thus ends the one hundred thirty-seventh edition of Blawg Review. 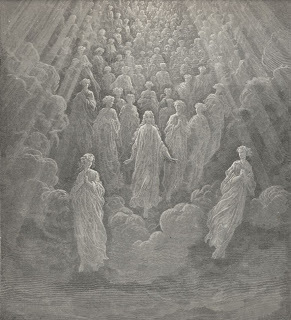 As was the case in Blawg Reviews #35 and #86, the engravings which accompanied each of the sections of this week's issue are by Gustave Doré and are from the illustrated edition of The Divine Comedy published in the 19th Century. A larger version of each image is available by clicking on the image. The complete illustrated edition (translated by Henry Francis Cary) and Henry Wadsworth Longfellow's Translation (not illustrated), from which I quoted, are both available online through Project Gutenberg. Finally, I'd like to recognize several bloggers whose work has appeared in in all three Blawg Reviews I've done. Congratulations to Stephen Bainbridge, David Giacalone, and Scott Henson for making it through Hell, Purgatory, and Heaven! Whether this is a tribute to their blogging longevity and continuing relevance in the legal blogosphere or merely circumstantial evidence of the bribes they've paid me, I will leave for you to determine. Blawg Review has information about next week's host and instructions how to get your blawg posts reviewed in upcoming issues. This edition of Blawg Review is a triumph -- I congratulate you on what may be the best presentation yet of Blawg Review! Thanks for an inspired Blawg Review #137!